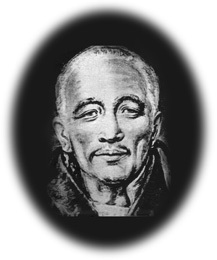 The Master Djwal Khul, known to many as the Tibetan, was a former student of the Master Kuthumi. Because of his specialized knowledge in Occult Philosophy and Cosmic law, Djwal Khul played a key role in communicating the Brotherhood's ideas and advice to the founders of the theosophy movement, Helena P. Blavatsky and Henry Steel Olcott, in the late 1880's and 1890's. He dictated a large part of H. P. Blavatsky 's The Secret Doctrine. It is for this reason he has been called "the Messenger of the Masters." When the great wars of 1914 - 1945 embroiled the world in conflict, he was given the task of providing that bridge teaching necessary to guide the world through a critical period and he did this by dictating volumes of Ageless Wisdom teachings through Alice A. Bailey (whose teacher was also the Master Kuthumi). He was instrumental in helping Mrs. Bailey set up a prototypical esoteric organization called the Arcane School (see www.lucistrust.org) that will eventually evolve into that needed for the dissemination of the World Teacher's teachings. The Master Djwal Khul is profoundly learned and knows more about the rays and planetary Hierarchies of the solar system than anyone else in the ranks of the Masters. He works with those who heal, and cooperates unknown and unseen with the seekers after truth in the world's great laboratories, with all who aim at healing and comforting the world, and with the great philanthropic world movements such as the Red Cross. He also works with certain groups of devas of the ethers, who are the healing devas, in their work to heal some of humanity's physical ills. Little is known of the Master Djwal Khul's past lives although we know he is closely associated with the Master Morya and of course, his teacher, the Master Kuthumi. These three incarnated at the time of Jesus' birth as the three Magis or Wise Men who followed the Star of Bethlehem to the Holy Infant and later saw to it that he was protected from the machinations of King Herod. "Suffice it to say, that I am a Tibetan disciple of a certain degree, and this tells you but little, for all are disciples from the humblest aspirant to, and beyond, the Christ Himself. I live in a physical body like other men, on the borders of Tibet, and at times (from the exoteric standpoint) preside over a large group of Tibetan lamas, when my other duties permit. It is this fact that caused it to be reported that I am an abbot of this particular lamasery. Those associated with me in the work of the Hierarchy (and all true disciples are associated in this work) know me by still another name and office. A.A.B. knows who I am and recognizes me by two of my names. I am a brother of yours, who has traveled a little longer upon the Path than has the average student, and has therefore incurred greater responsibilities. I am one who has wrestled and fought his way into a greater measure of light than has the aspirant who will read this article, and I must therefore act as a transmitter of the light, no matter what the cost. I am not an old man, as age counts among the teachers, yet I am not young or inexperienced. My work is to teach and spread the knowledge of the Ageless Wisdom wherever I can find a response, and I have been doing this for many years. I seek also to help the Master Morya and the Master Kuthumi whenever the opportunity offers, for I have been long connected with Them and with Their work. In all the above, I have told you much; yet at the same time I have told you nothing which would lead you to offer me that blind obedience and the foolish devotion which the emotional aspirant offers to the Guru and Master whom he is as yet unable to contact. Nor will he make that desired contact until he has transmuted emotional devotion into unselfish service to humanity, --not to the Master. The books that I have written are sent out with no claim for their acceptance. They may, or may not, true and useful. It is for you to ascertain the truth by right practice and by the exercise of the intuition. Neither I nor A.A.B. is the least interested in having them acclaimed as inspired writings, or in having anyone speak of them (with bated breath) as being the work of one of the Masters. If they present truth in such a way that it follows sequentially upon that already offered in the world teachings, if the information given raises the aspiration and the will-to-serve from the plane of the emotions to that of the mind (the plane where on the Masters can be found) then they will have served their purpose. If the teaching conveyed calls for the response from the illumined mind of the worker in the world, and brings a flashing fourth of his intuition, then let that teaching be accepted. But not otherwise. If the statements meet with eventual corroborations, or are deemed true under the test of the Law of Correspondences, then that is well and good. But should this not be so, let not the student accept what is said." A second ray (Ray of Wisdom) Master, the Master Djwal Khul works with the energy of right human relations. His Ashram is closely linked to the first ray Ashram of the Master Morya, through the work of Men of Goodwill and through all goodwill movements in the world. Goodwill is essentially an expression of the second Ray of Love Wisdom. He also works in close cooperation with the Ashram of Sanctus Germanus in applying intelligent activity to the energy of goodwill, a task demanded of all men and women of goodwill throughout the world.